Associate Professor and Director of the CHANGE Alberta research group in the Department of Family Medicine at the University of Alberta in Edmonton. Gastroenterologist at St Michael’s Hospital in Toronto, Ont, and Professor of Medicine in the Faculty of Medicine at the University of Toronto. Academic kinesiologist in the Department of Social and Preventive Medicine at Laval University in Quebec. Family physician in Laval and Assistant Professor and a clinical researcher in the Department of Family and Emergency Medicine at Laval University. Research associate in the Department of Family Medicine at the University of Alberta. Academic dietitian working with Nutrition Research Consulting in Fergus, Ont. Academic dietitian in the Department of Family Relations and Applied Nutrition at the University of Guelph in Ontario. Professor of Medicine and Epidemiology in the Department of Critical Care Medicine at Queen’s University in Kingston, Ont. Director of Operations for Metabolic Syndrome Canada. Associate Professor in the Department of Human Health and Nutritional Sciences at the University of Guelph. Problem addressed Primary care settings require a feasible program for integrating lifestyle interventions, which can reverse metabolic abnormalities, for patients in practice. Objective of program To integrate a lifestyle intervention program into existing primary care clinics with an interprofessional approach that includes dietitians and kinesiologists. Program description Canadian Health Advanced by Nutrition and Graded Exercise (CHANGE) provides a personalized approach to nutrition and exercise modification focusing on patients with metabolic syndrome. With CHANGE, exercise intervention is individualized (ie, tailored to individual preferences) and graded (ie, intensity is built up slowly over time); supervision and implementation of the program is conducted in a collaborative fashion between the family physician and the kinesiologist. Patients undergo an initial fitness assessment that determines their baseline aerobic, strength, and flexibility scores, and the same assessment is performed at 3 months and at 12 months. Conclusion The CHANGE program demonstrates how interprofessional primary care teams can support patients with metabolic syndrome in achieving their health goals. By including dietitians and kinesiologists in primary care settings to work alongside family doctors, many barriers to lifestyle interventions can be overcome. The team’s collaborative understanding of the patient combined with the patient’s own sense of urgency for change creates the opportunity for the formation of new healthy lifestyle habits. Although results are preliminary, CHANGE appears to be a feasible, implementable, and effective program. Despite the evidence showing that lifestyle interventions could substantially reduce the costs and complications of these medical conditions,19–22 delivery of these preventive care services in primary care remains low.23 In a recent national survey in primary care, less than half of family doctors reported discussing obesity and physical activity with their patients during their periodic health examinations, with counseling on lifestyle modifications limited by time and remuneration structure.23 In addition, reasons for the poor implementation of lifestyle interventions in primary care include lack of time, lack of resources, and limited training.24–27 Thus, while lifestyle interventions have been shown to be efficacious in the research setting, the resources and the personnel to implement these preventive care services in primary care are lacking, resulting in the focus of treatment being pharmaceutical rather than behavioural. Current gaps in the literature exist regarding the effective implementation of lifestyle interventions in primary care. Research addressing the feasibility, effectiveness, and efficiency in the primary care context is required to promote widespread adoption. CHANGE—Canadian Health Advanced by Nutrition and Graded Exercise. Following patients’ baseline fitness assessment, an individualized exercise program that addresses a series of factors to improve their health is designed for them. It is critical to emphasize that the fitness program is individualized. Factors to consider about the patient’s life include the following: Has the patient exercised before? What activities does the patient enjoy? Does the patient work part-time or full-time? Is the patient a single parent, divorced, or widowed? What is the patient’s health status? Where is the patient in terms of the stages of change (eg, precontemplation, contemplation, preparation, action, maintenance, or relapse)? The factors to consider are endless but the underlying principles are the same. Providers must understand what is important to each individual patient in order to assist him or her to develop a sense of urgency to make a lifestyle change. The kinesiologist sees patients weekly for the first 12 weeks and then every month continuing for a duration of 1 year. It is expected that within several weeks there will be a progression in exercise modalities, in accordance with the exercise tolerance of each individual patient. Table 1 presents an example of the typical progress a patient could achieve within the first 3 months of the program in terms of duration of exercise, intensity of exercise, diversity of exercise type, frequency of exercise, and number of repetitions. Typical progression of CHANGE exercise protocol: Progression from baseline to 3 months. Throughout the intervention, the family doctor receives summaries of patients’ goals and achievements from the kinesiologist in order to reinforce the messaging and to help support patients in achieving their goals. The CHANGE program has been successful in recruiting patients in Edmonton, Alta, Toronto, Ont, and Quebec city, Que. To date 307 patients with MetS have been recruited to the program by their family doctors. Table 2 shows the baseline demographic characteristics of the patients at the 3 CHANGE demonstration sites. Participation in the exercise components of the intervention is 96%. Preliminary results, based on data from the first 3 months of the intervention, have demonstrated that among those patients participating in the interdisciplinary, multi-component CHANGE program nearly 20% of them have reversed MetS after 3 months in the program. The presence of MetS is defined as a patient having at least 3 of the 5 criteria conditions for MetS. Reversal of MetS, therefore, is defined as going from having 3 or more of the criteria conditions to having less than 3 of the criteria conditions (ie, having normal values for the criteria conditions and not taking medications for those conditions). Preliminary data also show that participating patients have demonstrated considerable changes to fitness, strength, and flexibility scores (Table 3). Complete results of the 12-month intervention will report on the effectiveness and cost-effectiveness of the intervention. Successful implementation and preliminary positive findings suggest that this type of intervention is feasible. Baseline demographic characteristics from the CHANGE demonstration sites: (N = 307). The success of the CHANGE program is built on relationships with patients and a collaborative interprofessional health care team. Having a shared understanding about required lifestyle changes and creating a sense of urgency to undertake lifestyle changes are of particular importance. Sharing an understanding with patients supports them in discovering what is important to them. The team can then nudge and guide patients, but patients are empowered to make their own choices and choose what they want to do. Second, patients must have a sense of urgency about and believe that there is an importance to implementing the lifestyle changes. The strong collaborative approach by a primary care–based interprofessional team provides patients with guidance and education about physical activities to improve their health; however, only a patient can determine whether or not it is important to incorporate these health-improving activities in his or her life. Telling someone to change his or her behaviour is often met with resistance, but asking a patient to communicate how he or she will implement the lifestyle change empowers the patient to make the decisions and create his or her personal urgency.35,36 When this occurs patients become interested in learning more about exercise and physical activity. The individualized, graded exercise program can then be gradually built from the patient’s starting point, with progression of activities occurring each week. Exercise principles are applied to achieve optimal health and fitness benefits, which include specificity, overload, and recovery. During this period the kinesiologist continues to educate the patient while still referring to the understanding and urgency the patient communicated in earlier stages. Changes in frequency, duration, and intensity are implemented gradually into the exercise program, with the patients deciding when they are ready to increase exercise levels (Figure 1). In the CHANGE program, the kinesiologist and family doctor collaborate to challenge the patient to further his or her activity progress through encouragement and positive reinforcement, which is particularly important if the patient’s self-belief is low. Having the entire interprofessional team reinforcing the small achievements and the long-term goals, and supporting each individual patient in setting new SMART (specific, measurable, assignable, realistic, and time-related)37 goals helps build the patient’s momentum for the future.37 The use of SMART goals helps patients identify an area of improvement and create an action plan for measuring improvement and accountability.37 Patients consider the realistic nature of their goals and resources and establish a timeline for achieving results.37 Through SMART goal setting, the CHANGE program instils accountability in patients for their actions and provides supports for further improvements. Behaviour modification and readiness is critical, but only the individual patient can decide whether or not he or she wants to change. A key foundational principle of the CHANGE program is to let patients discover the importance of their lifestyle changes, let them develop a sense of urgency about implementing changes, and, most important, guide them so that they have the knowledge and skills to improve their own health. The potential beneficial effects of lifestyle interventions on MetS have been demonstrated.16 The CHANGE program is built on the evidence-based principles of effective lifestyle interventions, including individualized goal setting, supervised and graded exercise, and a collaborative, team-based approach to care with a long-term connection with the team. The results achieved are owing to an interdisciplinary effort of multiple components including diet counseling, exercise, and closer follow-up visits with family doctors. Establishing the CHANGE program in family medicine clinics ensures the main support and motivator (ie, the family doctor) for lifestyle changes remains connected to the patient. The family doctor can continue to monitor the patient, recognize issues early, and recruit further support from the team if necessary beyond the duration of the intervention. The program has been designed to be generalizable to other primary care settings. It should be noted that the high participation rates at the demonstration sites indicate a high level of motivation. Considering that 20% of the adult population has MetS, it makes sense for primary care to focus on patients with higher motivation. In Canada, the role of kinesiologists in primary care is evolving, with more health teams incorporating these health professionals into interprofessional primary care teams. A survey of 19 primary care networks (PCNs) in Alberta showed that there were approximately 30 kinesiologists working within these PCNS who supported lifestyle interventions. The number of kinesiologists per PCN varied from 0 to 4 (unpublished research). Currently, there are few studies published on exercise interventions that take place in primary care settings. A few previous studies have demonstrated the potential effect of exercise counseling by physicians in primary care but without the use of kinesiologists.38,39 Several studies have demonstrated the effects of including exercise specialists in settings other than primary care.34,40,41 Distinct from many of the exercise interventions in the literature, the CHANGE program is an interprofessional, primary care–based personalized approach to lifestyle change, focusing on supporting individual patients in making the program successful and new habits sustainable. Further evaluation of the effectiveness and cost-effectiveness of the CHANGE program is under way. Research is also being conducted to explore what types of primary care settings can implement a program like CHANGE successfully. The CHANGE protocol is an evidence-based diet and exercise program designed for primary care. The relationship between the patient and his or her health care team is very important. A strong and collaborative understanding of the patient combined with the patient’s own sense of urgency for change creates the opportunity for the formation of new healthy lifestyle habits. A personalized exercise program with frequent and regular follow-up with the team supports the patient in achieving his or her health goals. Although results are preliminary, the CHANGE program appears to be feasible, implementable, and effective. Demonstrating hard clinical outcomes such as mortality and cardiovascular events will require a longitudinal trial. The initial evaluation of the CHANGE program will focus on surrogate measures including reversal of MetS and reduced cardiovascular risk. 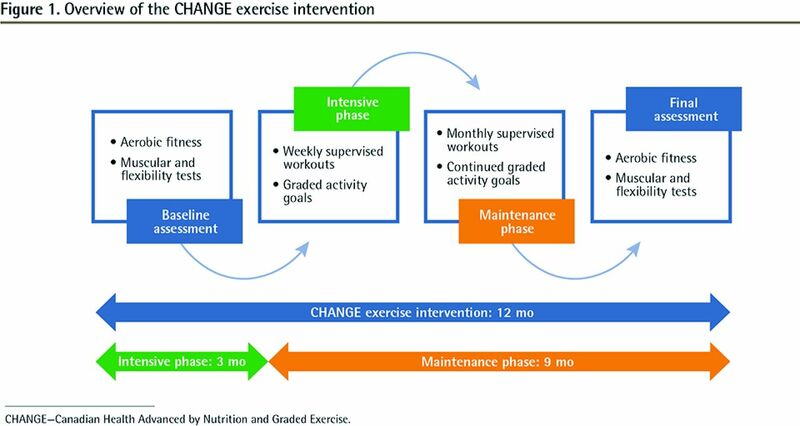 The Canadian Health Advanced by Nutrition and Graded Exercise (CHANGE) intervention is an evidence-based diet and exercise program designed for primary care. Focusing on patients with metabolic syndrome, CHANGE is built on the principles of effective lifestyle interventions, including individualized goal setting, supervised and graded exercise, and a collaborative, team-based approach to care. The results achieved are owing to an interdisciplinary effort with multiple components including diet counseling, exercise, and closer follow-up visits with family doctors. With CHANGE, exercise principles are applied to achieve optimal health and fitness benefits, which include specificity, overload, and recovery. Patients receive guidance and education from the health care team. Establishing CHANGE in family medicine clinics ensures the main support and motivator (ie, the family doctor) for lifestyle changes remains connected to the patient. The family doctor can continue to monitor the patient, recognize issues early, and recruit further support from the team if necessary. The program has been designed to be generalizable to other primary care settings. Le programme CHANGE (Canadian Health Advanced by Nutrition and Graded Exercise) est un mode d’intervention basé sur des données probantes qui associe régime alimentaire et exercice pour des patients des soins primaires. Axé surtout sur des patients présentant un syndrome métabolique, il cherche à modifier certaines habitudes de vie de façon efficace, en proposant à chaque participant de se fixer les objectifs qui lui conviennent, en lui faisant faire des exercices progressifs sous supervision tout en lui assurant des soins de santé au sein d’une équipe de soignants. Les résultats sont obtenus grâce à une collaboration interdisciplinaire regroupant plusieurs éléments, y compris des conseils sur la nutrition, l’exercice, et un suivi plus étroit avec les médecins de famille. Dans le programme CHANGE, on applique des principes de base de l’exercice, tels que la spécificité, la surcharge et la récupération, de manière à maximiser les avantages pour la condition physique et la santé. Les patients reçoivent aussi des conseils et de l’information de la part de membres de l’équipe de soins. En instaurant le programme CHANGE dans une clinique de médecine familiale, on s’assure que la personne qui peut le mieux aider et motiver le patient à changer son mode de vie, c’est-à-dire son médecin de famille, sera toujours en contact avec lui. Ce médecin pourra suivre ses progrès, détecter d’éventuels problèmes et recourir à l’équipe de soins si nécessaire. Le programme a été conçu de façon à servir dans d’autres établissements de soins primaires. Dr Klein is a board member for Metabolic Syndrome Canada but he has not received any salary or payment for this position. He has also received a grant for program expansion and the reimbursement of travel cost for dissemination of the results of the research related to the CHANGE program.
. Multiple chronic conditions: prevalence, health consequences, and implications for quality, care management, and costs. J Gen Intern Med 2007;22(Suppl 3):391-5.
. Harmonizing the metabolic syndrome: a joint interim statement of the International Diabetes Federation Task Force on Epidemiology and Prevention; National Heart, Lung, and Blood Institute; American Heart Association; World Heart Federation; International Atherosclerosis Society; and International Association for the Study of Obesity. Circulation 2009;120(16):1640-5. Epub 2009 Oct 5.
. Prevalence of metabolic syndrome in the Canadian adult population. CMAJ 2011;183(15):E1127-34. Epub 2011 Sep 12.
. The biology of the metabolic syndrome and aging. Curr Opin Clin Nutr Metab Care 2016;19(1):5-11.
. The cost of chronic disease in Canada. Ottawa, ON: Chronic Disease Prevention Alliance in Canada; 2004. Available from: www.gpiatlantic.org/pdf/health/chroniccanada.pdf. Accessed 2017 May 10.
. Chronic conditions. Making the case for ongoing care. Princeton, NJ: Robert Wood Johnson Foundation; 2002. Available from: www.rwjf.org/content/dam/web-assets/2010/01/chronic-care. Accessed 2017 May 10.
. Population projections for Canada, provinces and territories, 2005–2031. Ottawa, ON: Statistics Canada; 2005. Catalogue no. 91-520-XIE. Available from: www.math.yorku.ca/ssc/0010591-520-XIE.pdf. Accessed 2017 May 10.
. Growing up: the social and economic implications of an aging population. Certified General Accountants Association of Canada; 2005. Available from: https://core.ac.uk/download/pdf/6922689.pdf. Accessed 2017 May 10.
. Correlates of physical activity: why are some people physically active and others not? Lancet 2012;380(9838):258-71.
. Reduction in the incidence of type 2 diabetes with lifestyle intervention or metformin. N Engl J Med 2002;346(6):393-403.
. Effect of an intensive exercise intervention strategy on modifiable cardiovascular risk factors in subjects with type 2 diabetes mellitus: a randomized controlled trial: the Italian Diabetes and Exercise Study (IDES). Arch Intern Med 2010;170(20):1794-803.
. Effect of lifestyle intervention on metabolic coronary heart disease risk factors in obese older adults. Am J Clin Nutr 2006;84(6):1317-23.
. Effectiveness of a lifestyle intervention on metabolic syndrome. A randomized controlled trial. J Gen Intern Med 2007;22(12):1695-703. Epub 2007 Oct 6.
. Primary prevention of cardiovascular disease with a Mediterranean diet. N Engl J Med 2013;368(14):1279-90. Epub 2013 Feb 25. Erratum in: N Engl J Med 2014;370(9):886.
. Diet and exercise interventions reduce intrahepatic fat content and improve insulin sensitivity in obese older adults. Obesity (Silver Spring) 2009;17(2):2162-8. Epub 2009 Apr 23.
. Effects of lifestyle modification on metabolic syndrome: a systematic review and meta-analysis. BMC Med 2012;10:138.
. Effects of exercise and weight loss on cardiac risk factors associated with syndrome X. Arch Intern Med 2003;163(16):1889-95.
. The effect of metformin and intensive lifestyle intervention on the metabolic syndrome: the Diabetes Prevention Program randomized trial. Ann Intern Med 2005;142(8):611-9.
. Mediterranean diet and metabolic syndrome in an urban population: the Athens Study. Nutr Clin Pract 2011;26(5):598-606.
. Hypertensive men who exercise regularly have lower rate of cardiovascular mortality. J Hypertens 1999;17(6):737-42.
. The metabolic fitness program: lifestyle modification for the metabolic syndrome using the resources of cardiac rehabilitation. J Cardiopulm Rehabil Prev 2011;31(5):282-9. Erratum in: J Cardiopulm Rehabil Prev 2011;31(6):E1.
. Delivery of preventive care. The national Canadian Family Physician Cancer and Chronic Disease Prevention Survey. Can Fam Physician 2012;58:e62-9. Available from: www.cfp.ca/content/cfp/58/1/e62.full.pdf. Accessed 2017 May 10.
. The Centre for Obesity Management and Prevention Research Excellence in Primary Health Care. Canberra, Aust: Australian Primary Care Research Institute; 2012. Available from: http://aphcri.anu.edu.au/aphcri-network/centres-research-excellence-cres/centre-obesity-management-and-prevention-research. Accessed 2017 May 10.
. Supervised versus recommended physical exercise in hypertensive women. Is its recommendation enough? Blood Press 2003;12(3):139-44.
. Strength training improves muscle quality and insulin sensitivity in Hispanic older adults with type 2 diabetes. Int J Med Sci 2007;4(1):19-27.
. Effects of exercise on body composition and functional capacity of the elderly. J Gerontol A Biol Sci Med Sci 1995;50(Spec no):147-50.
. Development of a dietary management care map for metabolic syndrome. Can J Diet Pract Res 2014;75(3):132-9.
. Development of a single-stage submaximal treadmill walking test. Med Sci Sports Exerc 1991;23(8):966-73.
. The Canadian physical activity, fitness and lifestyle approach (CPAFLA): CSEP-health and fitness program’s health-related appraisal and counselling strategy. 3rd ed. Ottawa, ON: Canadian Society for Exercise Physiology; 2003.
. Resistance exercise and aerobic exercise when paired with dietary energy restriction both reduce the clinical components of metabolic syndrome in previously physically inactive males. Eur J Appl Physiol 2012;112(6):2035-44. Epub 2011 Sep 23.
. Perceived exercise barriers, enablers, and benefits among exercising and non-exercising adults with arthritis: results from a qualitative study. Arthritis Rheum 2006;55(4):616.
. Prevalence of, and barriers to, preventive lifestyle behaviors in hypertension (from a national survey of Canadians with hypertension). Am J Cardiol 2012;109(4):570-5. Epub 2011 Dec 10.
. There’s a S.M.A.R.T. way to write management’s goals and objectives. Manage Rev 1981;70(11):35.
. Physical activity promotion in primary care: bridging the gap between research and practice. Am J Prev Med 2004;27(4):297-303.
. Effectiveness of physical activity advice and prescription by physicians in routine primary care: a cluster randomized trial. Arch Intern Med 2009;169(7):694-701.
. Trial of prevention and reduction of obesity through active living in clinical settings: a randomized controlled trial. Arch Intern Med 2012;172(5):414-24. Epub 2012 Feb 27.
. Effects of exercise on glycemic control and body mass in type 2 diabetes mellitus: a meta-analysis of controlled clinical trials. JAMA 2001;286(10):1218-27.